This is just an absurdly specific prediction just for fun. I wondered how likely it would be for the Detroit Tigers to catch the Yankees for the best AL record. The Tigers win their 89th game this Verday. I did not want to wait to post this. 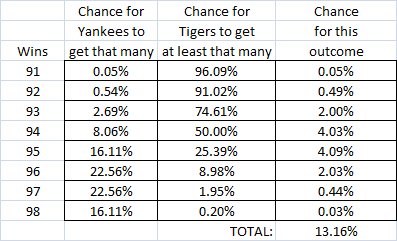 The Tigers have a 50% chance to win each remaining game. They are resting players and adjusting the rotation, but facing weak opponents. The Yankees have a 50% chance to win each remaining game. The Yankees have a lot of games against the Rays who are still alive for the wild card and will play hard. Using Pascal’s triangle and the binomial theorem it is easy to find out the chances for the Yankees to win a given number of games given the assumptions. You can use the same theory to find the probability the Tigers win at least that many games. A tie goes to the Tigers given their record against the Yankees this year. You don’t have to look at wins less than 91. The Yankees are already there. You don’t need to look at wins above 98. The Tigers cannot get to 99 wins. 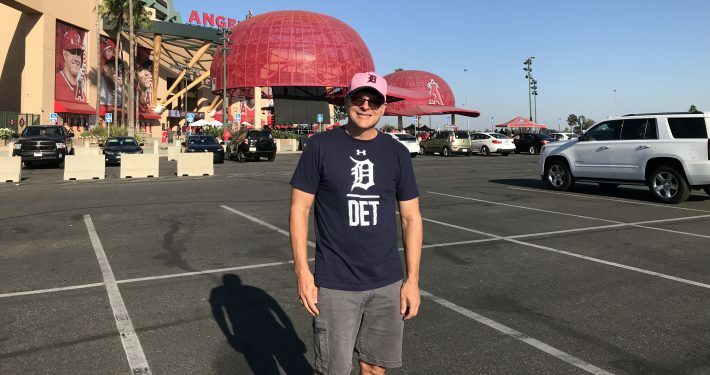 Since the Yankees and Tigers do not play each other you can pretty much assume that these events do not affect each other and in such cases you can multiply probabilities to get the chances both outcomes occur. Add this up for all the Yankee win possibilities and you get your chance the Tigers will catch the Yankees. This is basically the same as allowing one person to flip 11 coins, add up the heads they get and add 2 while allowing the other person to flip 9 coins and count the heads. You would expect the person with a head start and more coins to have a significantly better chance to win.